How can satellite imagery be used to monitor algal blooms ? Satellite imagery by itself is not sufficient to identify the phytoplankton species (harmful or not) that are blooming, but during cloud free periods satellite data are essential to monitor the daily development of the bloom. Early bloom detection allows scientists to sample the blooms, and - if blooms are found harmful - to put mitigation strategies in place in order to protect fishes or... swimmers. 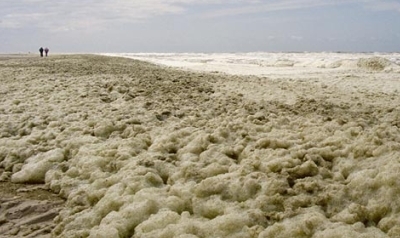 Phaeocystis blooms can produce unpleasant foam which often accumulates on beaches. Source: IVM.